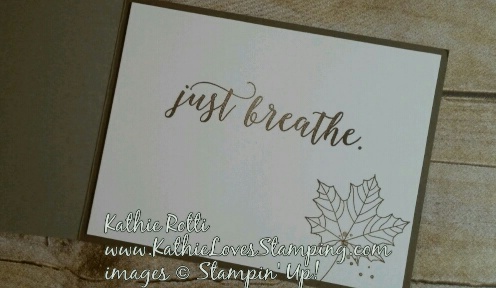 Welcome to the Stampin Friends Thanksgiving 2017 Hop! You have arrived at Kathie’s (that’s me!) blog. If you have arrived from Lana Staab’s amazing blog … I’m glad you came for a visit! Be sure to continue on though the hop until you get back to where you started. I hope you find lots of inspiration as you hop on through! The list of participants is at the bottom of this post. Be sure to read to the end … there is another amazing GIVEAWAY this month … details below! Here are my projects for our October hop … Thanksgiving. 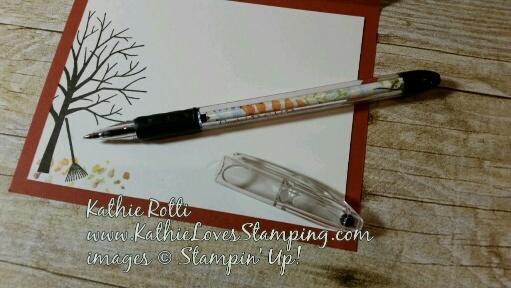 I chose to use the Stampin’ Up!’s Sheltering Tree stamp set (137163) for this project. My class wanted to do an Eclipse card, so I came up with this one. I like to teach/show a different technique every month. There are a number of techniques used on this one card: Eclipse, Baby Wipe and masking. Look closely and you may notice that the stamped sentiment says “thankful for”. The stamp actually says “thankful for you“. Because I wanted to use “YOU” as my Eclipse technique, I masked the “you” on the stamp with washi tape. 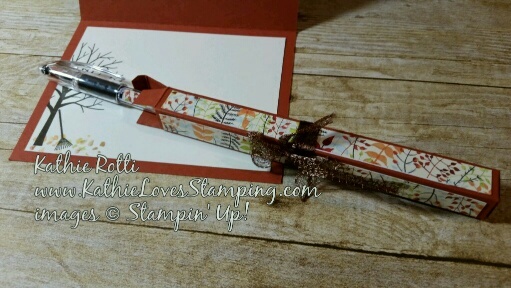 Just be sure to remove the washi tape after inking up your stamp in Early Espresso ink. I also stamped the tree in Early Espresso. After my stamping was complete, I used the Large Letter Framelits (141712) to cut out YOU using the magnetic platform and Bigshot. The letters are popped up on our adhesive strips. The strips are thicker than dimensionals and I like the higher “pop” for this. As always, I carry the theme from the card front to the inside. Don’t you think the little rake leaning on the tree is a nice touch? 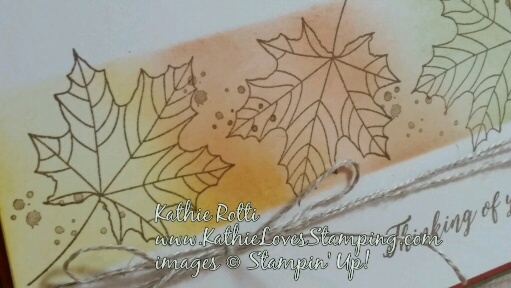 Don’t forget to add a few fallen leaves using the baby wipe you already have inked up! 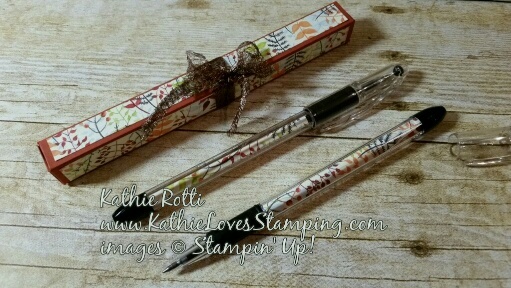 Here is my 3-D project … RSVP pens that I bought at Staples … I rolled up a small piece of the Painted Autumn Designer Series Paper and inserted it into the pen’s barrel. Then I made a simple box that holds the pen perfectly. Thank you to Ann Melvin’s YouTube tutorial for the box! Please click on Cindy Waldroff to continue on with the hop. Enjoy! Here is the information for the giveaway. 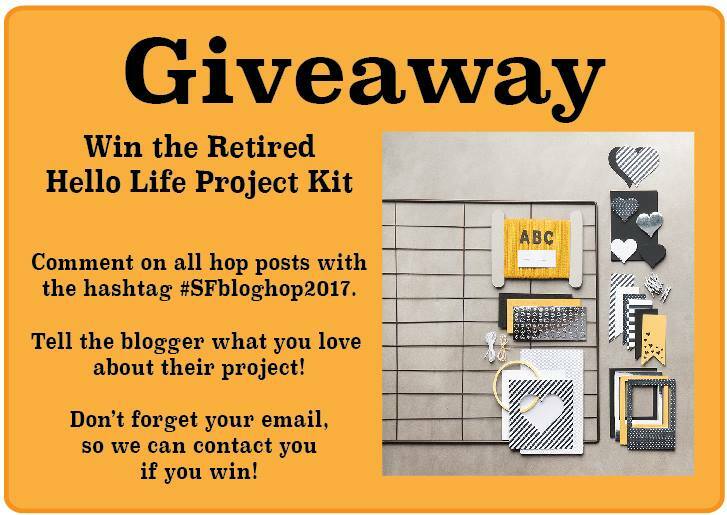 All commenters who use the hashtag “#SFbloghop2017” will be entered into the giveaway. Please comment before midnight on Thursday October 26, 2017 to be entered. Welcome to the Stampin Friends Fall 2017 Hop! You have arrived at Kathie’s (that’s me!) blog. If you have arrived from Lori Mueller’s amazing blog … I’m glad you came for a visit! Be sure to continue on though the hop until you get back to where you started. I hope you find lots of inspiration as you hop on through! The list of participants is at the bottom of this post. Be sure to read to the end … there is an amazing GIVEAWAY this month … details below! Here are my projects for our September hop … Fall. 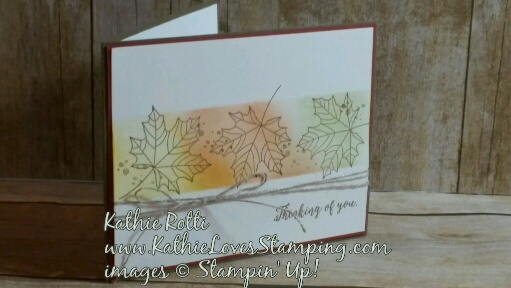 I chose to use the veined maple leaf stamp from Stampin’ Up!’s Colorful Seasons stamp set (143726) for this project. I went for simplicity with this card. I love the clean look. My sentiments are also from the Colorful Seasons stamp set. I stamped in Soft Suede ink. I masked my card front layer with two pieces of copy paper (top and bottom), leaving a 1- 1/2″ gap in the center of the Very Vanilla cardstock. Then I sponged with Crushed Curry, Cajun Craze and Old Olive inks. The sponged area is slightly narrower than my stamped images. I like a clean crisp straight edge to it. I also wanted a tiny portion of the image to go “out of bounds”. I wrapped just the top layer with linen thread before adhering to the Soft Suede card base. The splatter is from Timeless Textures (140517). I “stamped off” the Soft Suede ink before stamping the splatter. 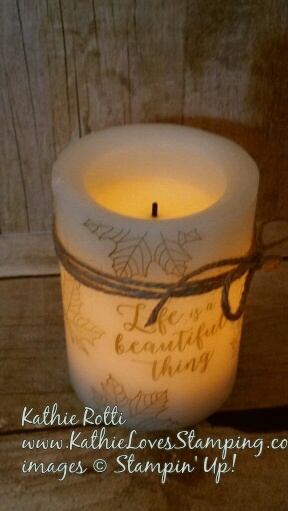 A battery operated vanilla WAX candle from Hobby Lobby is my 3-D project. 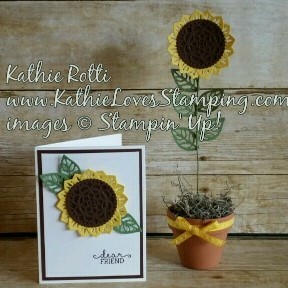 No need to worry about the tissue paper that I used for my stamped images catching fire! When done, I wrapped the candle with a length of the new Jute Twine (144625) from Stampin’ Up!. I love how thick the jute is. I use a name brand waxed paper for this technique. I don’t know if it matters … but I wasn’t taking any chances. Here are some other hints for this technique . 1. Trim the images you stamp on the white tissue paper close to the image. 2. Apply one image at a time. 3. Change out the waxed paper frequently to assure it is waxy for each image. 4. Be sure you hold the waxed paper snuggly with no puckers. 5. Keep your heat gun moving .. as soon as the tissue paper “disappears” it’s DONE! Please click on Sue Vine’s to continue on with the hop. Enjoy! Here is the information for the giveaway. All commenters who use the hashtag “#SFbloghop2017” will be entered into the giveaway. Please comment before midnight on Thursday September 28, 2017 to be entered.